I would like to introduce you to an organization that helps nonprofits such as America’s Disaster Relief raise money. They have created an innovative way for the business community to help the nonprofit sector. Theirs is a very simple yet powerful concept. Their members are real estate agents, mortgage lenders, and insurance agents who have donated millions of dollars to nonprofits when the public chooses to do business with them. They are experienced and successful professionals who believe in giving back to the communities they serve. Please take a few minutes to read the following letter addressed to the supporters of America’s Disaster Relief. The potential of their proposal is enormous in terms of helping ADR raise the needed funds to better accomplish our mission. The times are always changing, and we need new models of how to adapt and flourish in this ever new environment. REBSEA is just such a model of how we can harness the power of business to solve our social problems such as meeting the needs of those affected by disasters of all kinds. Please feel free to forward this email on after reading it in full. Help and support comes in many differ ways - thank you for yours. * 100% of the Donations go to Disaster Relief - just where one expects a donation to go and should. We want to help America’s Disaster Relief – ADR, raise more money to accomplish its mission. We believe that it is the 'grass roots', the very Heart and Soul of America, that best knows the real needs in our communities. This is even more true in times of disaster. Our organization is similar in spirit to ADR. We focus on helping nonprofit organizations who are without the huge grants and government assistance given to the large national Non Profit Organizations - NPOS. ADR is greatly in need of donations from the 'grass roots' in order to accomplish their missions and we would like to help. We are the 'grass roots'. 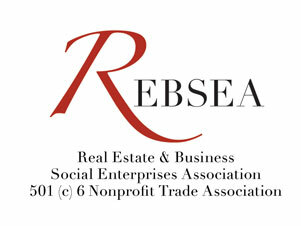 We are REBSEA, the Real Estate and Business Social Enterprises Association, a 501 (c)6 nonprofit trade association. REBSEA was founded by 135 Realtors, lenders, and insurance agents in 46 states and across Canada who have been donating to and/or actively work with nonprofits as part of the way they conduct their business. Our members have donated millions of dollars earned from their business to nonprofits in their communities. Many of our members have founded nonprofits of their own as well. 3) REBSEA members have donated millions of dollars to nonprofits. We will inform our membership, our database, and our extensive social media network about the great work done by ADR and encourage them to support ADR with their donations. 4) When major disaster strikes we will ask our members, our database, and our extensive social media network to donate directly to ADR. We will explain the dire need for second responder aid "once the shock has worn off and reality has set in". We understand ! If you would like to help us to help America’s Disaster Relief please contact me directly at david@rebsea.org or call me at 855 352 4973. We are here to help.